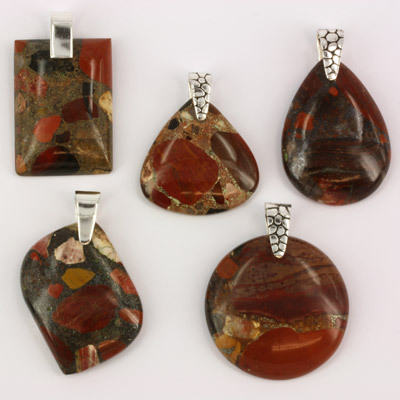 Conglomerate Jasper and Sterling Silver Pendants. Wholesale. Buy Australian Gemstone Jewellery Directly from Supplier. 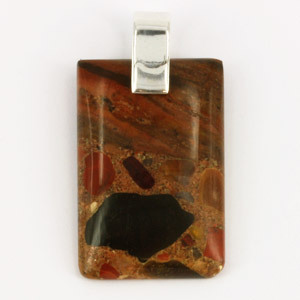 Conglomerate jasper contains fragments of many different rocks, mainly jasper, quartz and chert. It is found in the Mid West region of Western Australia. Conglomerate jasper is sometimes also called chert breccia. A conglomerate is a rock consisting of individual fragments of pre-existing rock within a finer-grained matrix that have become cemented together. Conglomerates are sedimentary rocks consisting of rounded fragments.